HOUSTON, TX — State Representative Hernandez (D-Houston) joined over 100 local business leaders, elected officials, and community members at the Holiday Inn in Channelview on Thursday, April 19. The event, the first of its kind in the region, was hosted by Amir Khan, CEO of Ashland Hospitality, Inc., and his wife Sabrina. Other officials in attendance included Houston Mayor Sylvester Turner, State Representatives Armando Walle (D-Aldine) and Mary Ann Perez (DPasadena), Harris County Constable, Precinct 2 Constable Chris Diaz, and Jacinto City Mayor Ana Diaz. Attendees discussed the need for regional cooperation, pressing workforce needs, and the importance of strong leadership that recognizes those issues at all levels of government and in the private sector. 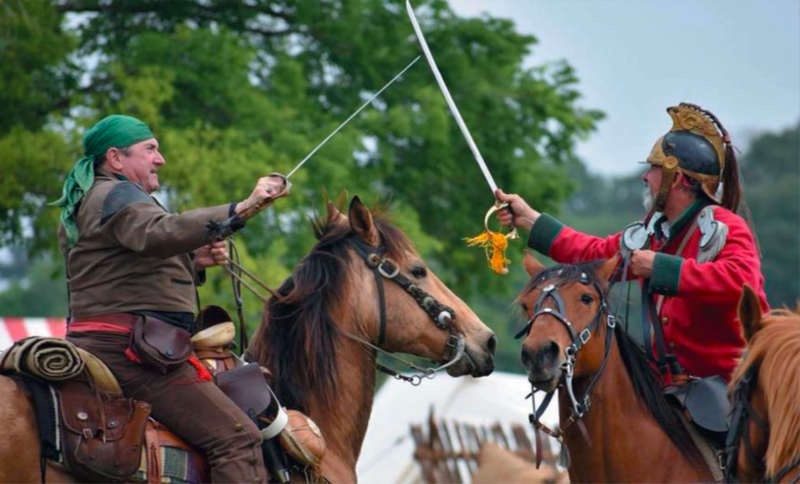 Above: Andy Anderson in the role of Juan Seguin (an Alamo survivor fighting at the battle of San Jacinto) duels with a Belgian mercenary cavalier. Last Saturday, the The Battle of San Jacinto was reenacted 182 years after that day with the same results: the largest land mass ever secured from a single 20 minute battle won, from Antonio Lopez De Santa Anna, by an army of irregulars numbering about 900 total, against a left behind battalion of 1400 regulars that had been in an army of about 9,000, chasing the irregulars over much of Texas. Sam Houston outwitted the “Napoleon of the West” by allowing Anna to believe the Texans would not present battle. Houston was wounded in the ankle; acting President of the Revolutionary Republic of Texas, David Burnet, ordered that Houston be abandoned on the field with his wound. Decent individuals loaded him onto a New Orleans bound ship and he survived. Later in 1836, Sam Houston would become President of the Republic of Texas, followed by a hero of the battle Mirabeau Lamar in 1838; following Lamar, anti-slavery Houston would be President again. Henry Smith was the first elected president, in 1835, before the revolution was won, but impeached in January 1836. James Robinson lasted from January 1836 until March. Galena Park, TX. 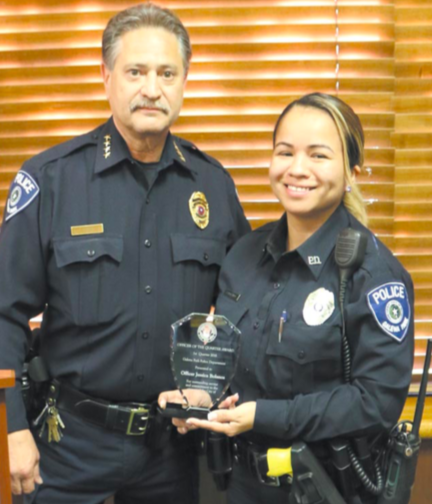 — April 17, 2018 — At the City Council meeting Galena Park Police Chief Rick Gonzales presented Detective Jessica Bolanos for her investigation and arrest of a child molester. Jacinto City, TX. 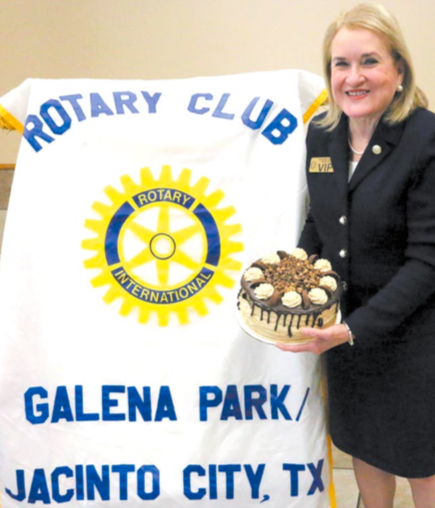 – April 17, 2018 — The Galena Park/Jacinto City Rotary Club held their annual cake auction, setting a fund-raising record. According to Maria Rodriquez, Director and 2018 Chairperson, the auction raised nearly $10,000 to benefit students with scholarships. Amir Khan, CEO of Ashland Hospitality, Inc., made the highest bid of the event, of $500 for a German Chocolate cake baked by Brandon Ceniceros with the GPHS Culinary Class. Rodriquez, the club’s Past-President, said, “We doubled the money collected from the past years.” She baked and donated 9 of the 43 cakes auctioned, and serves as the Rotary District 5890 official photographer. 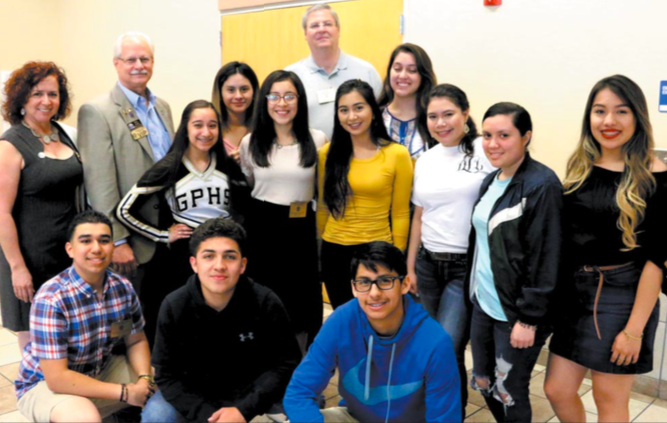 Standing L – R: Maria D. Rodriguez, GP/JC Rotary Club, Past-President, Bill Palko, District 5890 Rotary Club Governor, Aliyah Silva, Lupita Ramírez, Pamela Pérez, Bryan Clements, GP/JC Rotary Club, President, Astrit Flores, Crystal Arguelles, Daniela Lira, and Jennifer Ramirez. Kneeling L – R: Oscar Silva, Galibadlo Villareal, Ju-Juan Morín.